For the most part, The Movie Mind tries to avoid the lame, stale, clichéd play on the movie title that most cheeseball critics throw out there. At some point you may have read from some hack, “This film was “The Perfect Storm” of drama, intrigue, and excitement.” How clever. Unfortunately, I’m having a hard time avoiding that cliché here because simply put, watching this film is a Win Win scenario for all viewers. Want a sports movie? It has some decent elements of competition without the typical Hollywood sports movie ending that we all usually see coming from miles away. Do you like family and real life drama? There’s plenty of real world relationship dynamics and family conflict that most people can relate to. It’s not too goody-two-shoes, yet it still has some life lessons and positive messages without being too overbearing. Overall, this is just one of those rare well-written, well-acted, original stories that flies under the radar because it’s not one of your typical big budget remakes. Paul Giamatti and Amy Ryan (also known as Holly Flax from The Office, or the reason Michael Scott left Dunder Mifflen) are your typical middle class family in the Jersey suburbs struggling to stay afloat financially. 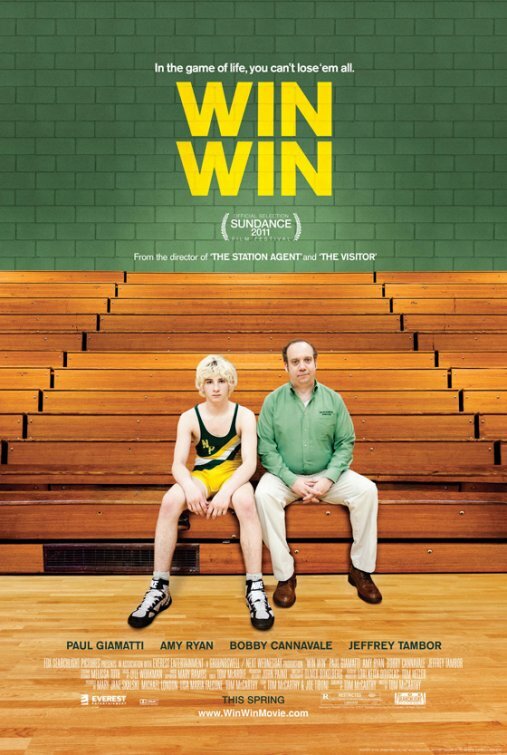 Giamatti (Mike Flaherty) is a lawyer with a flailing practice who doubles as a high school wrestling coach that couldn’t buy a win if he tried. He seems to generally be a good guy with a good heart, but when up against the wall with mounting financial responsibilities, he does something, well, pretty skeevy. Somehow we still keep pulling for him even though we’re put off by his sketchy decision. Call that the magic of Paul Giamatti. Amazingly, he’s not quite as much of a Debbie-downer as he has traditionally been in other roles so it’s exciting to watch. Flaherty’s bad decision begins to spiral and when a kid shows up on his doorstep, lacking direction, a guardian, and someone who cares about him. While he steps in to fill those voids, we are always wondering though if he is working to fill his own voids more. The young Alex Shaffer (Kyle) is very solid in his debut as the kid in search of a family and place to fit in. He doesn’t say much throughout the movie other than some one-liners, but he doesn’t have to. The truth is he’s probably about as revealing as most real world teenagers. The supporting cast composed of Jeffrey Tambor and Bobby Cannavale are excellent and bring some much needed levity to the story and dialogue. Even Burt Young adds a nice punch as a recognizable actor with a limited yet pivotal role. It only helps that we know him as Paulie and can easily see him being on the verge of dementia. The best way to describe this film is to say that it has heart. The characters have heart, the writing has heart, and the story, while not necessarily heartwarming per say, has the right mix of softness and edge. I have to give props to the writer, Thomas McCarthy, who hasn’t written much but might be most recognized as “Dr. Bob” in Meet the Parents. I’m all for watching him try to replicate his winning recipe again and again. Interesting Cameo Appearance: The one and only Burt Young (otherwise known as one of the best characters of all-time, aka Paulie from the Rocky sextet) as Leo Poplar, the amusing grandpa still trying to keep his wits about him. Jackie Flaherty: We have kids, Mike. I’m not taking any chances with Eminem down there. Terry Delfino: This kid’s got manstrength, dude. Mike Flaherty: This kids got a chance to do something special, maybe even change his life. Mike Flaherty: I did not think it would get this complicated. im a fan of this flick. fios had it available “before DVD and Netflix”, which usually means its doomed, but the wife and I enjoyed it. Definitely a pleasant surprise…glad to see others liked it as well. really loved this film…was not expecting it to be so…funny!